The most enchanting Met exhibition ever? Has an exhibition ever been more purely enchanting than “Rooms With a View: The Open Window in the 19th Century,” at the Metropolitan Museum of Art? From your first moment in the galleries, you are plunged into an early-nineteenth-century European world that is both intimate and expansive. The intimacy is in the tranquil beauty of the interiors, so lovingly rendered in these generally small paintings and graphic works. And that intimacy is underscored in the many instances where the interior is the artist’s own studio, with furnishings suggesting an austerely classical taste. The expansiveness is in the windows that are a leitmotif in every single work, opening onto a busy river or a harbor, or a cubified fragment of urban roofscape, or a panorama of Roman monuments, or a sliver of blue sky. Sometimes the curtains have been drawn, because it is nighttime or because a thin fabric is needed to temper strong sunlight. The approach the artists take is documentary, at times almost journalistic, and yet the impact is lyric, poetic, romantic. The figures who occupy these rooms tend to be relatively youthful; at least the ones I found myself noticing certainly are. Going through the light-filled galleries at the Metropolitan, I felt as if I were witnessing not only the youth of the nineteenth century but also the youth of modernity—a time when the sense of self, the sense of one’s own interiority, was set in a delicate, perilous balance with a gathering awareness of the enormity of the world, a world one could barely comprehend, much less control. You can sense—as if it were just beyond the periphery of the artist’s vision—the turmoil of war, revolution, ideology, industrial progress. Many of these rooms suggest an urbanized, inward-turning pastoral: arcadia as a room of one’s own. 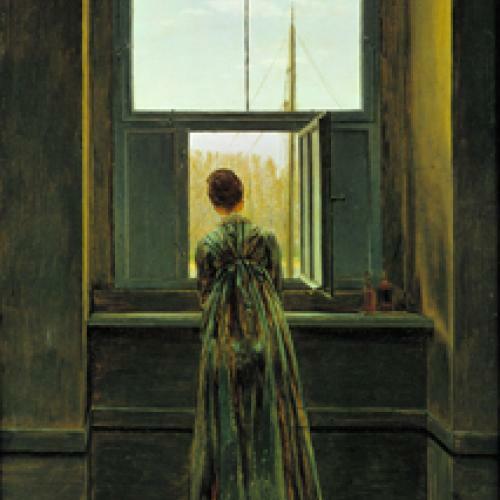 Caspar David Friedrich, Woman at the Window, 1822. 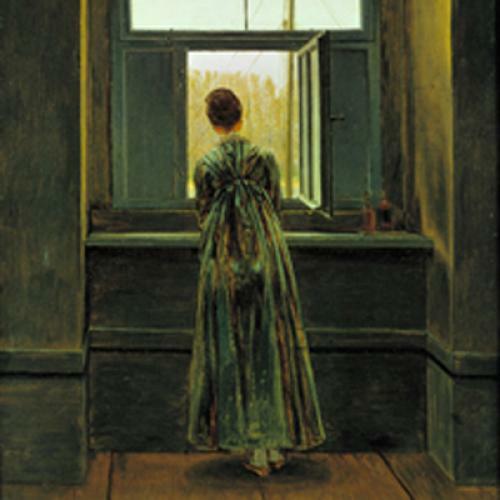 A few of the artists included here will be familiar to American museumgoers, especially Caspar David Friedrich, whose painting of his wife looking out a window at the Elbe is at the center of the show, an allegory of the enigmas of consciousness in which a woman with her back turned to us regards a landscape we can barely see. Georg Friedrich Kersting’s paintings of men reading or writing or painting in serene, almost ascetic interiors have also become fairly well known in recent years. Although the touchstones of the exhibition are the German artists whose paintings and drawings we have come to regard as landmarks of the Biedermeier sensibility, with its temperate romanticism and subduedoptimism, the curator, Sabine Rewald, has brought together works from all over the Continent to create an exhibition that has the hallucinatory power of an echo chamber. The simplest of themes—the room, the window, the vista, the solitary figure—are subjected to endless, delightful, at time even baffling variations. I have rarely seen an exhibition that feels so strongly stamped with the personality of its curator, and I mean this as a high compliment. It is unusual for a museum show, especially a show in a top flight museum such as the Metropolitan, to strike a museumgoer with some of the force of a private obsession, but that is the impact of “Rooms With a View.” The depth and intensity that Rewald brings to a theme that is by some measures prosaic is a testament to her curatorial powers; I was almost going to say her visionary powers. And yet this is the kind of show—featuring little-known artists and a theme with philosophical implications—that many major museums would now deem too specialized and even obscure to ever earn a place in a busy exhibition schedule. Think of “Rooms With a View” as an island of calm in a frenetic cultural calendar. From her tours through the galleries and storerooms of museums all over Europe, Sabine Rewald has gathered together works that anatomize a master theme in nineteenth-century art—and probably in nineteenth-century literature as well. 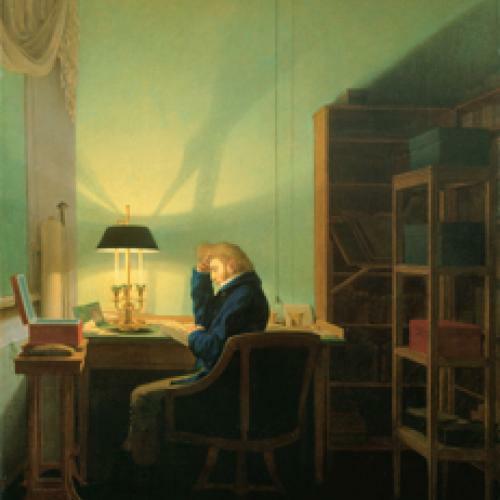 Georg Friedrich Kersting, Man Reading by Lamplight, 1814. “Rooms With a View” is very much a show about the beginnings of modern painting, which Rewald suggests toward the end of her catalogue essay, when she writes glancingly of Bonnard, Delaunay, Mondrian, and others. The view through a window became an essential motif in twentieth-century art, a way of grappling with the ever more complex relationship between art and reality that was embraced by Vuillard, Bonnard, Matisse, Picasso, Marquet, Derain, Delaunay, Chagall, Balthus, and many other artists. But the historical significance of the works in “Rooms With a View” goes well beyond matters of iconography. I see foreshadowings of the modern urge to abstract reality in the feeling many of the artists have for the picture space as a flat surface that echoes the flat surface of the window itself, and in their often subtlely sensuous handling of paint, ink, watercolor, and graphite. Friedrich’s portrait of his wife at the window is so lightly painted—at once surprisingly sketchy and absolutely specific—as to feel phantasmagorical. And there is something of the twentieth-century artist’s idealization of geometry in the strong areas of solid color in Kersting’s Man Reading by Lamplight and Wilhelm Bendz’s Interior from Amaliegade with the Artist’s Brothers. As for Johann Erdmann Hummel’s Sitting Room, done in pen and black ink and wash, Rewald is right on target when she says that the interior is really just an excuse for Hummel to indulge his “delightful mania for mirror reflections, shadows, symmetry, and, of course, perspective.” The task of representing reality has trumped reality. The exterior has been interiorized. Had reality become too much to bear?